Debbie Holmes is Dean of Library Services and is the ALG Library Coordinator for the College of Coastal Georgia. She is also a member of the Regents’ Academic Committee on Libraries (RACL) since 1999 and has worked with open educational resources (OER) through RACL. 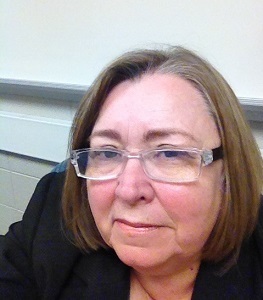 Ms. Holmes recruited faculty by assisting evaluating OER textbooks, developing LibGuides, holding events during Open Access week and presenting at the college launch week. Collaborating with Dr, German Vargas the ALG Campus Champion, they visited faculty offices and held a series of workshops over the course of several semesters. Ms. Holmes worked with the Mathematics CCGA faculty to address the high cost of mathematics through the adoption of open textbooks and low-cost online homework systems. Currently this program has expanded to other USG institutions to implement a set of low-cost and open educational resources and affordable materials in one or more of the math courses College Algebra (MATH 1111), Trigonometry (MATH 1112), Precalculus (MATH 1113), and Probability and Statistics (MATH 2112), supported by previous Textbook Transformation Grants project participants and co-leaders Dr. German Vargas and Dr. Victor Vega, in the Open Mathematics in Action project.